Join In the Fun on December 8th! Put on your best smile and come meet Santa at the Osseo Community Center! 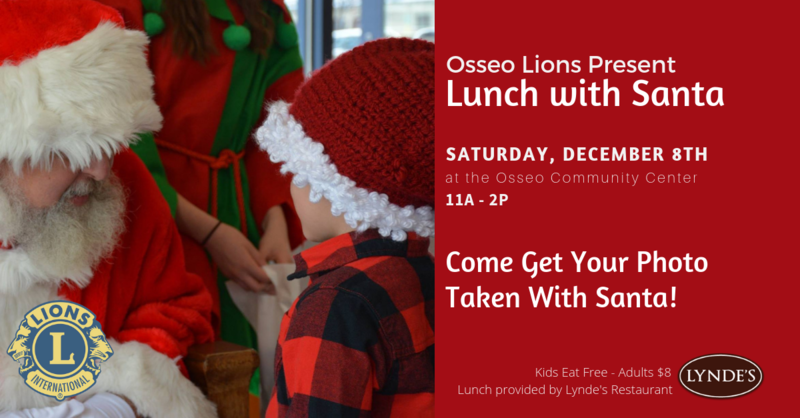 Lunch with Santa is sponsored by the Osseo Lions Club to celebrate families. Come get your photo taken with Santa Clause and enjoy a nice meal with friends and family. Lunch is provided by Lynde's Restaurant & Catering. Hi Rebecca – Assuming you landed on our event page you should be able to see the date and location in the sidebar or image in the body of the event. We’ll be hosting at the Osseo Community Center in downtown Osseo MN. You can find a map of the facility here: https://goo.gl/maps/6Tzi5hy8RuD2. Tickets for the adult meals will be sold at the event; day of. We hope to see you and your family there. Happy Holidays! Will the event go until 1 or 2pm? You have 2pm, but the discover osseo page says 1pm. I’m really hoping it’s 2 so we can stop in but the earliest we could arrive is 1 as one of our boys has an activity until 1230. We love this event and have been attending for years. Hi Elizabeth. We’re scheduling until 2p, but food and activities are subject to availability which is why Osseo may have said 1pm. Hoping you can make it with the kiddos this year.